As of January 2014, Dark Manor is one of Big Fish Games’ newest hidden picture games for the PC. First off, I’m not a big gamer, but I love all types of puzzles. I followed a hidden picture game to Big Fish Games, where I purchased it with a new customer promotion they were doing at the time. Unfortunately, that particular game just didn’t last very long. Dark Manor: A Hidden Object Mystery Game presented itself as a similar game with rich graphics, but with some extra levels and game play opportunities. What looked like a great game on the surface is, in reality, a rolling headache. It could easily be a nightmare for an avid gamer, or for someone who spends money on game currency. That said, this is a review of the PC version, which apparently rolled out very recently (reviewing at the end of January, 2014). Users of the iOS game report a considerably more favorable experience on average. 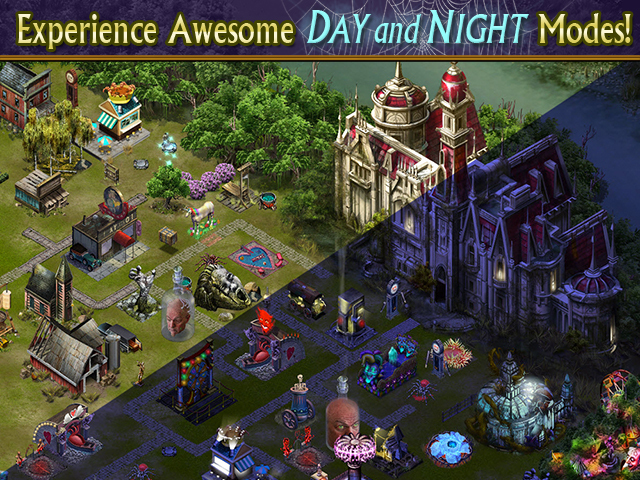 Dark Manor is a free-to-play game that relies on social contacts, similar to Farmville or Pioneer Trail in the sharing aspect, but to a lesser degree. That is, depending on where you download the game, you have the option of whether or not you want to connect it to social networks. You’re given a number of free invites per day, allowing you to add complete strangers for people to visit or from whom to receive gifts. The game centers on the story of Sterling, a rich but deceased southern gentleman in the Louisiana Bayou sometime around the 1920s. His wives, also both deceased, serve as your guides. They teach you to gather ectoplasm off of the items around you through hidden picture puzzles, which then let you navigate through the supernatural world. As you progress, you start to learn details about how each of these characters died, as well as the role each played in the sordid tale. You get Sterling’s mansion and the responsibility of decorating. Buy expansions with in-game silver or gold bars, then place decorations to gain juju. More juju means more unlocked scenes. Leveling up unlocks more decorations, “walkers” (recurring juju earners), and attractions that produce silver at regular intervals. Decorations all look normal in the daylight setting, but click the skull icon in the lower left-hand corner and they transform into Halloween-like splendor as ectoplasm specters emerge. Hidden object scenes earn by far the most silver and XP. These take energy to explore, and are often the focus of quests and achievements. When it works properly, energy replenishes at one unit every three minutes. As of level 23, it allows 50 units of energy at a time. This amount never seems to go up, but perhaps does somewhere in the higher levels. Each scene takes 15 units of energy to explore, then an extra 2 units if you want to spin for a chance at one-time boosts or gold bars. Especially for a free game, these graphics are awesome. They’re rich, realistic, and truly beyond what could be used in this type of game even a couple of years ago. Some of the scenes are fairly dark, though, so you’ll want to turn the brightness up on your screen. More than once I’ve forgotten that, with the result that the item I searched for was totally invisible. This is on a 1080p HD LED screen with a high-quality video card, so it has great resolution and contrast – it’s just a dark game. Okay, here’s where we get down to the true problem with the game. It’s buggy. Like, they’ve come out with two new versions just this month (January 2014) and it not only didn’t fix the bugs, it made it worse. It takes forever to load despite being on a computer with a 4MB cache and processing speeds of 2.8-2.9 GHz. Even with nothing else running, it still takes forever. While it does freeze and/or crash on occasion, that’s only happened a few times. Tech support suggested updating the video card, but mine is as updated as it can get. It is on Windows 8.1, and maybe that makes a difference. To date, the worst problem has been the result of the last update. Now my energy doesn’t load at all. It used to load, but I’d have to shut down the game and open it back up to see the level rising. The only way I can get energy is buy it, receive gifts of energy, get it as a random award from the Tesla coil, or collect my single energy unit every time I visit a neighbor. That last wouldn’t be too bad except it takes a full 5 minutes to visit a neighbor because of the loading problems. As suggested, I uninstalled and reinstalled the game, but to no avail. Finally, it does have an option to connect to Facebook. It’s interfered with my ability to get on Facebook while the game is running from the start, so I thought maybe I could clear that up by actually connecting the game to my profile. No luck, it couldn’t load up to connect. Woohoo!! I’m happy to announce that my previously stated issues with the game are now a thing of the past. They finally did something right with the updates, and everything is working properly now. Energy refills as it should and quests work as they’re intended. The only real bug that’s left is that they changed a bunch of scenes, and some of them didn’t update automatically. If the thumbnail picture and scene look different, you may have to go into your program files and delete the files associated with that particular scene. The next time you play, it will automatically install the newest scene. Rating updated — I love this game, and it has now been playing bug-free for a couple of months. Aah, the bliss of having a properly-working PC version is now a reality. The developers are obviously working to make this a high-quality game and to keep offering new goodies for long-time players. Level 45 now with 13 chapters unlocked, and still more chapters have been recently added. Well worth taking the time to play. Disclosure statement: I have no affiliation with the creator or any other representative of this game. Its publishers, designers, agent, or other affiliated individuals have not offered compensation for my review. The opinions expressed here are entirely my own. I just updated this one — they fixed all those terrible bugs :D. Now it’s definitely the perfectly enjoyable game it was made to be :). The scenes and items in Dark Manor are being revised to make them simpler and easier to complete. This is unfortunate because the original artwork was in keeping with the theme and much more interesting and challenging. Although Dark Manor continues to release updates to fix the connection problems, the problems continue to exist for some players. A big disappointment is that you can’t invite friends to become your neighbors.